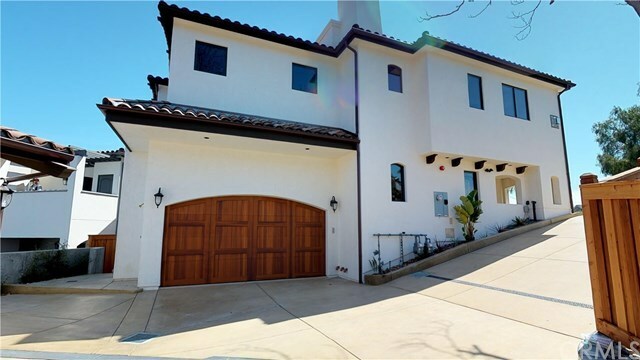 This ultra custom new construction Spanish inspired masterpiece is perched high above the view just 2 short blocks to the best beach on the central coast. Offering panoramic Pacific Ocean and bay, Avila Valley, Golf course, and San Luis Creek views, this 3 bedroom + office, 3 bath stylish custom home tops 2660 sqft feet of living space plus over 400 sqft of exterior and roof decking to soak in the stunning scenery. Centered in the heart of Downtown Avila Beach, this well appointed home has a spacious great room, sliding wall to the view in both the kitchen and living room, elevator for quick access to each floor, zoned heating/cooling, and architectural details that rival its amenities. Features include: open concept kitchen/ with farmhouse sink, Kitchen-Aid Pro Grade Appliances, custom lighting throughout, hand scraped oak floors, solid knotty Alder doors, Sierra pacific wood-clad casement windows, Emtek hardware, Kohler fixtures, Security alarm, dual laundry, elevator, dumb waiter, full 2+ car garage, view decks and enclosed view balconies, 360* roof party deck with outdoor kitchen, custom sound system, outdoor shower, and pre-wired throughout so you can enjoy all of life's modern amenities within a thoughtful layout and logically designed space. Truly a one-of-a-kind property in the most sought after location along the Central Coast. Directions: Take Avila Beach Dr to San Luis St. On 2nd st, go right. The property is on your right.